The stone remains of a small enclosure castle with four turrets situated near Ben Nevis on the shores of River Lochy. Castle is unmanned and free to view at any reasonable time. A nearby cairn marks the site of the 1645 battlefield. Castle is owned by Historic Scotland but is unmanned. To survive the surprise attack by the Royalist forces and inflict a defeat on Montrose. To defeat the Covenanter forces of Archibald Campbell mustered at Inverlochy. To inflict a defeat on Royalist forces in revenge for the imprisonment of the Lord of the Isles. To survive and repel the assault by Clan Donald. By the fifteenth century relations between the Scottish Crown and the MacDonalds (whose clan chief held the title Lords of the Isles) were fractious. When James I was released from captivity in England, he sought to break their power. In 1428 he summoned Alexander, Lord of the Isles to come before him at Inverness Castle. When he duly appeared he was arrested and imprisoned. Although released in 1429, Alexander returned to Inverness and burnt the town in retaliation. A Royal expedition forced Alexander to submit to James in August 1429 and he was again imprisoned, this time in Tantallon Castle. Notes: Castle is sign-posted from the A82 and is found on an unnamed road with a small (free) car park immediately adjacent. The battlefield cairn is a short walk from the castle. Inverlochy Castle was built by the Comyn family in the thirteenth century to control the south-west access to Great Glen and in 1431 was the scene of a battle between Royal forces and those of the Lord of the Isles. In 1645 the Marquis of Montrose led a small force around Ben Nevis and defeated the Covenanter force holding the castle. Inverlochy stands at the foot of the Ben Nevis mountain range, Britain's tallest mountain, at the convergence of the River Lochy with Loch Linnhe. The site acquired its name from the Gaelic Caisteal Inbhirlochaidh (meaning "Castle at the mouth of the Lochy"). Historically the waterways of Scotland were the main communications arteries and Inverlochy's location gave it waterborne access to and from Loch Linnhe with the Sound of Mull beyond. Crucially it also gave access to the Great Glen of Albyn, a main line of communication through otherwise mountainous terrain of the Highland massif. 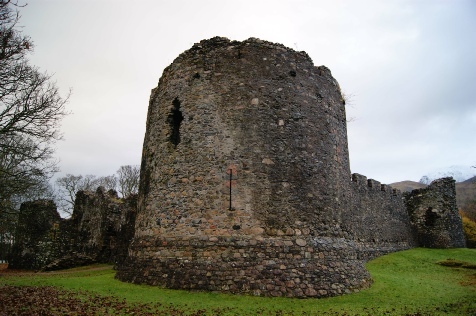 For these reasons it is perhaps not surprising that a fortification was built at Inverlochy. Legend has it that Inverlochy was the site once the seat of King Bancho, founder of the Stewart dynasty. 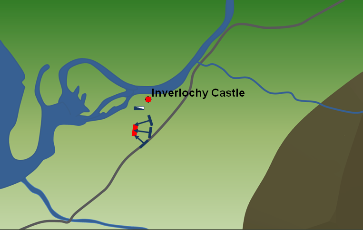 Folklore also states Inverlochy was the scene of a treaty between King Achaius and Charlemagne around AD 790. Alas both stories are almost certainly fiction. Bancho was not the founder of the Stewart family nor is it likely any treaty was ratified at Inverlochy at this time. Notwithstanding the dubious nature of these myths, the superb locations means it is probable that some form of small settlement and/or fortification did exist at Inverlochy at this time but any trace of it has been lost. 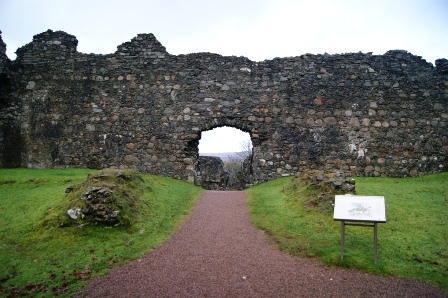 The castle ruins seen today were built circa-1280 by John 'Black' Comyn, Lord of Badenoch and Lochaber. He was the descendant of Norman immigrants who had come to Scotland during the reign of David I (1124-53). That King had used such men, who brought castle building expertise with them, to help bring his unruly country under control. In the early years the Comyn powerbase was centred in southern Scotland but the family was soon on the rise particularly after William Comyn secured the role as Chancellor of Scotland. In 1212 his descendant, also called William Comyn, married Majorie who was the sole heir of Fergus, Earl of Buchan. This brought the family control of huge swathes of northern Scotland including Inverlochy. The family remained at the heart of both Scottish and English politics - John Comyn (1215-75) fought at the Battle of Lewes with Henry III - and forged a close alliance with the Balliols. John's son - John 'Black' Comyn - continued this association and, following the unexpected death of Alexander III in 1286, became one of the Guardians of Scotland ruling as one of six regents on behalf of the infant heir Margaret, Maid of Norway. 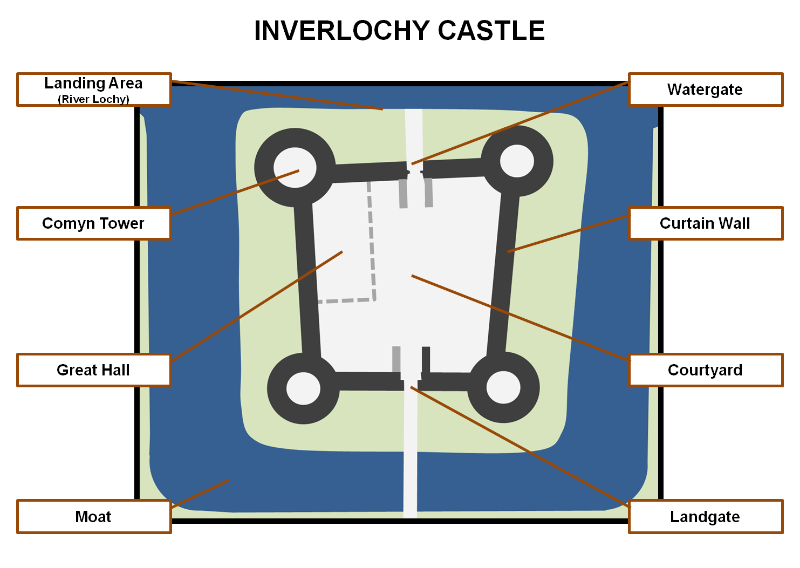 It was concurrent with these events that Inverlochy Castle was built both as a high status residence for the Comyns and to ensure control of the south-western access to the Great Glen. Its design was influenced by the contemporary Welsh fortifications of Edward I in that it was configured in a broadly symmetrical quadrangular arrangement. Four large round towers on each corner were connected by a substantial curtain wall over 3 metres thick. 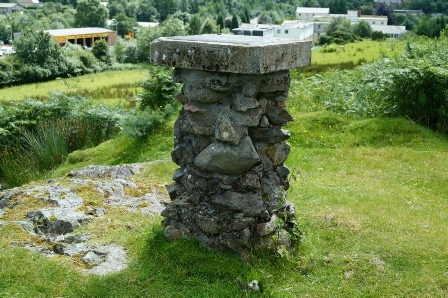 This structure was surrounded on three sides by a ditch that was flooded by water from the adjacent River Lochy that protected the fourth and final side. The structure had two gates - a land gate on the south side and a watergate to the north - both of which were protected by a barbican. There was no keep or final refuge. The quadrangular courtyard would have hosted all the facilities associated with such a residence including Great Hall, kitchen, brewhouse, bakehouse and stables. In 1645 the Marquis of Montrose approached the battlefield over the foothills of Ben Nevis - the summit of which can just be seen in the picture. Inverlochy Castle was sited on the waterfront with good access to Loch Linnhe. Margaret, Maid of Norway died in 1290 leaving no clear successor. Thirteen candidates came forward with a claim to the Scottish throne including John Comyn who claimed descent from King Donald III. The Guardians of Scotland, which included John, invited Edward I of England to arbitrate on the succession. The English King ultimately ruled in favour of John Balliol and under his rule the Comyns reached the height of their political power - not least as John Comyn was married to the King's sister, Eleanor Balliol. John's reign was short-lived. Edward I's attempts to assert his overlordship left the Scottish King little choice but to rebel. Perhaps encouraged in his defiance by John Comyn, he ignored English demands for men and money to support a continental war then entered into negotiations for mutual support with the French. Ultimately this led to war with a large English army invading and defeating the Scots at the Battle of Dunbar (1296). On 21 June 1296 King John capitulated to Edward I. On 8 July, at Montrose, he was stripped of his Royal regalia and forced to abdicate with Edward I choosing to keep the Scottish throne vacant. At the same gathering John Comyn gave homage directly to Edward I.
John died at Inverlochy Castle in 1302 and was followed by his son, John 'Red' Comyn. He served as Guardian of Scotland during the period 1296 to 1306 whilst the Scottish throne lay vacant. However, in 1306 Robert the Bruce started an uprising against Edward I of England. His opening move was to murder John, due to his rival claim for the Scottish throne, in Dumfries. The death of Edward I, as he was marching north to crush Bruce, followed by the weak and ineffective rule of Edward II gave Bruce's rebellion the space to succeed. He defeated the Comyns at the Battle of Inverurie (1308) and took control of Comyn lands many of which went to the MacDonalds and Campbells. The victory at Bannockburn (1314) secured Bruce's reign. 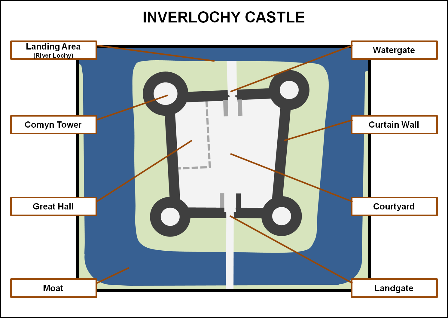 After the fall of the Comyns it seems use of Inverlochy Castle significantly declined and it was only occupied sporadically. Nevertheless the castle was still defendable in the early fifteenth century as it was seized by Alasdar Carrach MacDonald as part of a campaign against James I following his imprisonment of Alexander, Lords of the Isles in 1428. Although a Royal army commanded by Alexander Stewart, Earl of Mar ejected Alasdar, a force under Donald Balloch landed at Inverlochy. 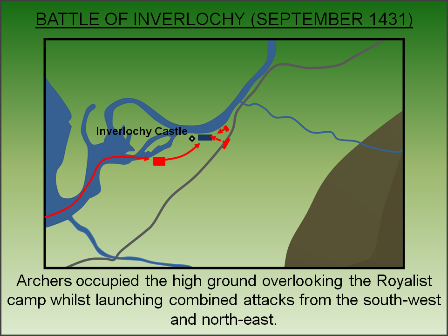 A battle ensued - now known as the First Battle of Inverlochy - in which Donald and Alasdar routed and massacred the Royalist force. See right for further details on the battle. Despite the Solemn League and Covenant, relations between the Covenanter and English Parliamentary deteriorated significantly. The execution of Charles I, done without reference to Scotland, sent shock-waves throughout Scottish society. The Stewart dynasty had ruled since 1371 and there was little appetite to follow England's lead into a republic. Instead the Covenanters eventually proclaimed the exiled Charles II as King nominally of all Great Britain. English reaction was swift with Oliver Cromwell invading Scotland with a 16,000 strong force. His victory at the Battle of Dunbar (1650) paved the way for Scotland to be overrun - the first time and only time in its long history that the country was completely occupied - and Inverlochy was key to sustaining control. However, rather than repair or rebuild the old medieval castle, Cromwell built a new bastioned fort closer to Loch Linnhe with better access to the sea. Built in 1654 the new facility was an earth and timber construction. It was substantially rebuilt in stone in 1690, following the first Jacobite rebellion, at which point it was named Fort William after King William III. The new fortification gave its name to the modern settlement. Inverlochy Castle was allowed to drift into ruin. In 1863 a stately home was built by Lord Abinger two miles to the north-east of the medieval castle. 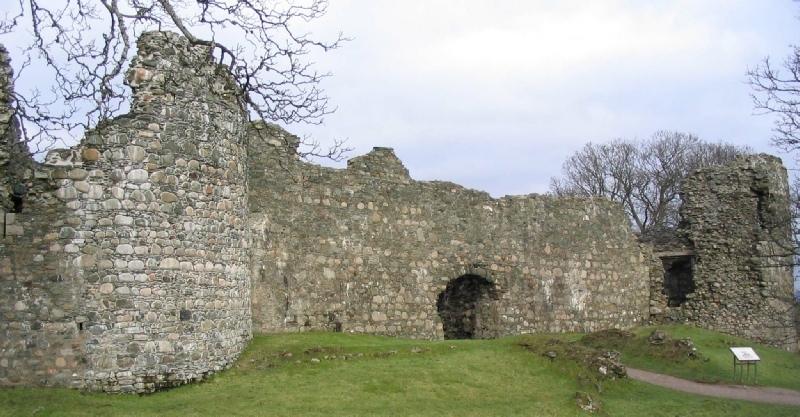 Although it had no defensive features, its owners called it Inverlochy Castle and re-named the former medieval structure 'old' to distinguish it from the newer building. This stately home hosted Queen Victoria in 1863 and remained a private residence until 1969 when it was converted into a hotel. Use of the castle continued to be sporadic through the sixteenth century despite it being acquired by Gordon, Earl of Huntly in 1506. 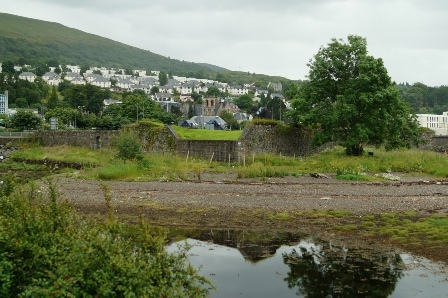 The condition of the castle in the seventeenth century is unclear - it is likely that it was ruinous - but nevertheless it formed part of the deployment of Covenanter troops during the Second Battle of Inverlochy (1645). In Summer 1644 King Charles I had appointed James Graham, Marquis of Montrose as Captain General in Scotland. Montrose effectively mobilised the Highland forces and won early victories at the Battle of Tippermuir (September 1644) and Aberdeen (October 1644). By early 1645 the Covenanters were raising armies against him with one of the forces - commanded by Archibald Campbell, Marquis of Argyll - at Inverlochy. After a stunning advance over the foothills of Ben Nevis, covering difficult terrain in the midst of Winter, Montrose emerged out of the morning mist and routed the Covenanters. Archibald Campbell survived the defeat, escaped the battlefield and would later pursue a vindictive campaign to see Montrose executed. It did him little good though as he himself was executed as a regicide following the Restoration of Charles II. See right for further information on the battle.